When I first saw Kevin in July 2012 at the OFI Orangutan Care Centre and Quarantine in Central Indonesian Borneo, I was impressed by the size of his canines, the length of his claws, and how powerful he looked. Like most people, I did not dare get too close to his cage. Desi, much smaller in size and with grey hair on her face, looked much less impressive, but I also kept a safe distance because she seemed to be always grumpy and quick at biting if your hands got too close to her cage. Hilda was in a dark cage where it was difficult to see her unless you got real close, which I didn't venture doing. Every day I would get rotting logs from the nearby forest to give to the bears. They loved ripping through them to get to the termites, larva, and forest cockroaches. They just couldn't get enough of them. After a few days, the bears were greeting me with happy faces as I arrived in the mornings. Desi is a female, she is at least 15 years old. in 2007 by Dr Biruté Mary Galdikas, founder of OFI. 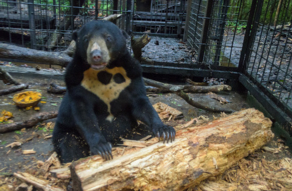 They were so thrilled about getting these logs and ripping them apart, thrilled about doing what sun bears love to do. They showed no aggression towards me and soon allowed me to stick my arms in their cages to pat them and play. Within 10 days of daily treats, I was physically in the cages of all three bears, playing and cuddling with them. Anyone of them could have hurt me in no time, but they were just happy to have company and thankful for all the logs they were receiving. They just wanted to play and be occupied. They trusted me and I trusted them. We became friends. When I played with one bear, the others would watch enviously, impatiently waiting their turn. With the approval of Dr Biruté Mary Galdikas, I added extensions to Kevin’s cage to make it more spacious and comfortable. I also put all the bears together. Kevin had undergone a vasectomy, so there was no risk of breeding. The 3 bears became friends right away and it was blissful to watch them play. They were so happy to be together. Kevin is male of about 4 years old. He has been in the care of OFI since he was a cub. Hildagaard is a female aged between 4 and 5 years. from a private owner who wanted to sell her for her gall bladder. I later had to leave them to reintroduce two other sun bear cubs to the wild. These two cubs confirmed how happy sun bears are to be together and how important it is for them to have space and trees to be able to express themselves and liberate all the energy they have. They are extremely active animals, always on the move, day and night. 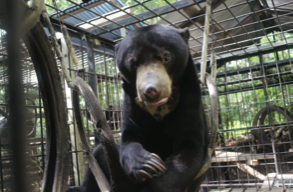 For a sun bear, being alone in a cage without anything to do and little space to move is torture. Desi, Kevin and Hilda are victims of deforestation and human greed, and have done nothing to deserve life imprisonment in solitary confinement. They were lucky to be rescued by OFI, and are lucky to be together, but they are in desperate need of space and things to do. 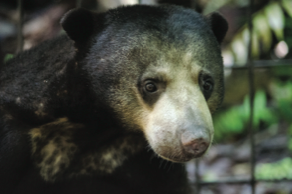 Unfortunately, we cannot give them back their freedom, because captive adult sun bears don't have the skills to readjust to life in the wild, but we can give them a better place to live. kept after by OFI staff but suffer from lack of space and stimulation. With the approval Dr Biruté Mary Galdikas and the OFI board, I have begun making a large forest enclosure of about 1 hectare in size on OFI land, next to the Orangutan Care Centre. 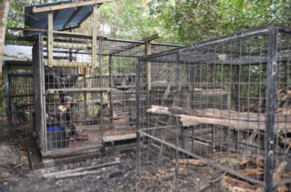 In this enclosure the 3 bears will be able to forage, dig, play, climb, and nap in the trees. Their quality of life will definitely be much better than it is today. I am presently on site supervising the construction of the enclosure and managing construction expenses, but I can’t cover all the costs with my private funds. I need your help to be able to see this project through. You can make a donation on OFI’s website (www.orangutan.org) or directly to me on the blog www.help3sunbears.blogspot.com where you can also follow the updates on the construction. Thank you for helping these 3 wonderful bears get a better life.